Call Jim’s Mowing & Gardening on 310-5467 to have your gardens and lawns expertly maintained, and fertilized correctly for the plant type, season and growth stage. Or you can book a gardening job online 24/7. The results from regular fertilizer applications are magical! 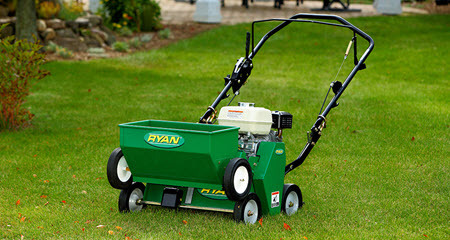 Fertilizing the lawn can replace nutrients taken out by frequent mowing. A lawn with adequate nutrients will be greener, better able to resist disease, and survive extreme weather. Why Do Plants Need Fertilizing? 1. Nitrogen (N), in most fertilizers, is derived from sulphate of ammonia, ammonium nitrate or “agran”, as well as urea and calcium nitrate. 2. Phosphorus (P), is commonly derived from superphosphate, blood and bone. 3. Potassium (K) is derived from muriate of potassium, sulphate of potassium, and potassium nitrate. These three elements are known as the macro elements and, by law, the levels in every fertilizer are stated on the bag. There are thirteen other essential elements for optimum plant growth; these are commonly called the micro elements and they include iron, copper, zinc, sulphur etc. Plants also require a complex balance of other chemical elements – but in much lower quantities. Most often, individual ‘trace elements’ are not applied but, instead, a fertilizer containing the major three elements plus the trace elements is used. If you are purchasing a fertilizer without trace elements added, you can add trace or micro-elements to the fertilizers by buying a separate trace element mix. Use trace elements at the recommended label rate only. What Kind of Fertiliser is Best for Lawn? The type of fertilizer you need depends on your individual lawn. As well as the typical fertilizers, there are a whole range of organic fertilizers available. Jim’s Mowing Franchisees can provide our clients with a soil test, which should ensure proper frequency of application and the right products to apply. With established turf, we are typically interested in green leaf color. The element responsible for this green color in turf, is primarily nitrogen (N). Therefore, we need a fertilizer high in nitrogen with a balance of potassium (K) and phosphorous (P). A typical N:P:K ratio for a turf fertilizer would be 22:10:8, certainly dependant on the time of year. How Often Does Lawn Need to Be Fertilized? Generally, it is recommended you apply fertilizer to turf four to five times a year, or roughly every six weeks. How Much Fertilizer to Apply to Lawns? Application is at the rate recommended on the package. Make sure the soil is damp before application and then water in thoroughly to ensure that the fertilizer is absorbed entirely, which can prevent any possible burning. Jim’s Mowing also specialize in gardening, lawn mowing, snow removal, fertilizing, hedging, power raking and power washing, aerating, and landscaping. View our services for more information or book a job online.